If you’re looking to decorate and spruce up your house for Autumn, here you’ll find some Pumpkin Flower Planters that will look awesome around your home. And while pumpkins may be growing in your garden right now, there are other ways to take a pumpkin or funkin and transform them into a pretty planter to display a variety of plants including our favorite traditional fall flower: mums. We hope you’ll find your fall inspiration within this incredible collection of beautiful and simple DIY projects that take the humble pumpkin and turn them into lovely, bespoke planters that you’re absolutely going to love! This is an incredible, brightly colored planter that will perfectly house your seasonal mums! You’ll use a faux pumpkin from a craft store like Hobby Lobby for this project, since it’d be a shame for your beautiful planter to rot. For easiest crafting, pick a hollow or foam pumpkin. Once you’ve got your pumpkin ready, simply drop your planter of mums in and voila! We’ve seen a lot of “tipsy” or “topsy-turvy” stacked planters, but this one really screams Halloween! These are constructed out of those cheap plastic jack-0-lanterns you can get for about a dollar at most supermarkets. To hold this tipsy planter tower together, you’ll also want a nice, sturdy, tall garden stake. When you’re finished stacking and planting, you’ll have a display that’ll really wow the neighbors! Burlap isn’t going anywhere! You’ll find this trendy fabric everywhere, from weddings to birthday parties, and you’re sure to love it as a planter as well! This is another way to re-purpose a cheap plastic pumpkin from any superstore. Using Mod Podge, you’ll attach strips of burlap in layers. 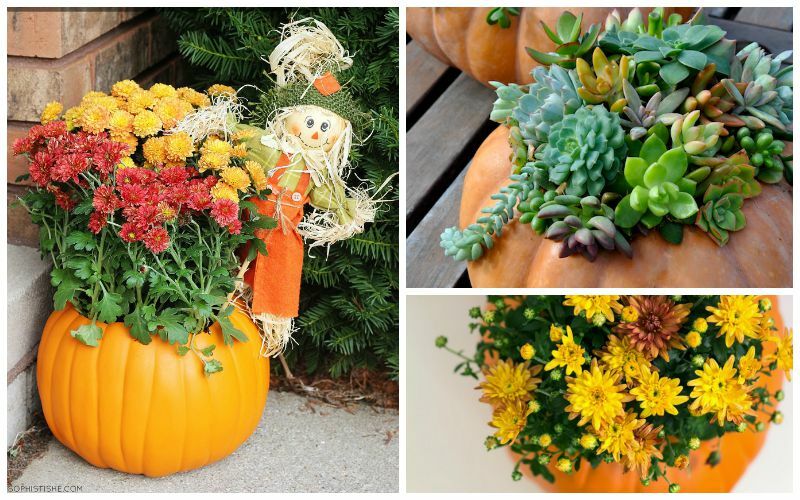 This is a charming take on the traditional pumpkin planter, utilizing low-maintenance succulents instead of mums or other fall flowers. Succulents do well indoors, and your pretty pumpkins should last a month or two as long as you mist twice a week and keep in a cool area. Instead of a faux pumpkin, it’s recommended that you use a large Fairytale Pumpkin, since they have flat tops and are easier to work with. This take on a real pumpkin planter filled with low-maintenance succulents prefers the squat, round Cinderella variety of pumpkin with a light green hue. Because this is a real pumpkin, it has limited display time before it starts to decay, so a table-top centerpiece like this one is best made the day before a Halloween party. For extra spookiness, hot glue a few toy spiders or other creepy crawlies to the outside of the pumpkin. If you haven’t already noticed, we’re a big fan of succulents, especially when they’re used as a centerpiece, since they’re just so versatile. Succulents come in all kinds of colors, shapes, and textures, which makes them ideal for unique centerpieces. This variation on the succulent pumpkin can be applied to pumpkins of any size as well as the miniature varieties. Since real pumpkins unfortunately rot, for this project you’ll be placing a plastic bag between the pumpkin and the soil, so you can quickly disassemble your project and re-pot your succulents! Here’s another super trendy take on pumpkin planters, utilizing a look that’s just about as popular as burlap; chalkboard paint! This is a pretty simple project, utilizing those cheap dollar planters you find basically anywhere during this time of year. To transform these bright orange Jack-O-Lanterns, paint them with a few layers of chalkboard paint, add your mums, and you’re all set! The best part about this project is that you can so easily change the message on your planter throughout the season. Okay, so what if you don’t want to run out and buy a bunch of materials for fall decorating? Never fear! You can re-use and upcycle some old plastic containers from around the house to create brand new Halloween decorations and planters! With painter’s tape, paint, and some pretty flowers, you can make bright, smiling Jack-O-Lantern planters. Best of all, this a super fun, easy project for the kids to help out with! If you’re looking for a more subtle, elegant way to decorate for fall, ditch the orange pumpkins for white faux pumpkin planters filled to the brim with your favorite bunch of succulents. This is an incredible bespoke display that you can definitely keep year around. The white of the planter and the dusky jade of the succulents contrast beautifully as well. This adorable variation on the faux pumpkin planter utilizes an enormous plastic pumpkin as the planter, which is then filled with one or two colors of mums. The little addition of the scarecrow stake adds just a bit more festivity and fun to the design! Swap the scarecrow out for a spookier stake as Halloween gets closer, or even for an ominous sign leading up to your door. More succulents! This take on the faux pumpkin planter opts to leave the top of the “funkin” intact and instead create cut-out windows into the hollow interior, where the succulents are planted and surrounded by pebbles. This is a great project that allows you to customize how many openings you want, how large they are, and what shape. Just be sure to add drainage holes in the bottom!